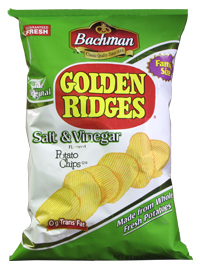 This is the best of Bachman's newly designed Chips bags. If only because the flavor is made clear, where on some of their other bags it is not quite as obvious. However, their website is still a little confused because Salt & Vinegar flavor is a replacement for their Vinegar flavor - it says so on the bag, if not on the website. While the design of the bag still lacks modernity and theme, the green color is strong and noticeable on shelves. Ridged Chips usually need a certain thickness to ensure there are not a large quantity of broken Chips in the bag. Similar to the other Ridged Chips in Bachman's collection, the thin grooves achieve this. The thickness along with the thin ripples allowed for a soft crunch, which is not quite what you are looking for in a Chip, but it wasn't because of oiliness. The Ridges are narrow and presumably the fact that vinegar is a liquid, the finger residue is minimal, and what there is relates to the salt aspect of the flavor partnership. The Chips are thick and firm in nature, which was good. Having surveyed most Salt & Vinegar flavors available in the UK, the place of origin for this particular flavor, we have to say the Salt & Vinegar flavors in the US are often a little vinegar reliant. These were no different. The original 'Vinegar' flavor description was probably more accurate. It was a little overwhelming, with the salt unable to balance the taste.